First African American and first woman in Massachusetts to serve as an on-camera Legal commentator-editor for a major television network affiliate (NBC) WBZ-TV in Boston, MA (1978). 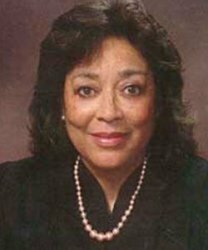 In 1979 she became the nation's first African American female Magistrate Judge. She became the country's first African American Chief United States Magistrate Judge in 1996, serving until 2009. This Honorary member was also the first African American female President and Co-founder of the Urban League of Eastern Massachusetts. She is now First Lady of Tuskeegee, Alabama (2006 - present).